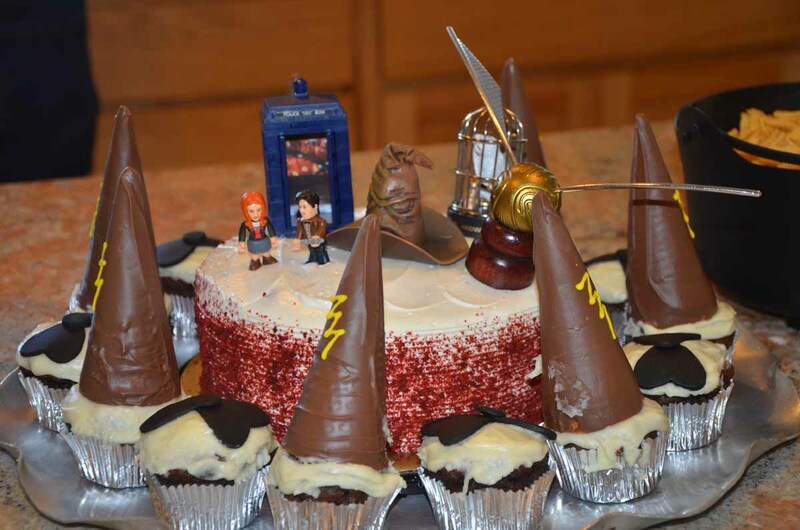 ' Baby Shower - Harry Potter and Doctor Who Themed - Sisters, What! So I have this amazing friend that loves all the same books, shows and generally "Geeky" things I do. On her honeymoon her and her husband went to The Wizarding World of Harry Potter in Orlando, how awesome is that. They are just the funnest couple I know. Anyways we got to know each other best through Pinterest where our common likes kept showing up. When I offered to host her first baby shower I asked about themes she instantly said " Harry Potter and Doctor Who." And was I excited. Now I know most of our followers know about our families love for Harry Potter so I won't explain that. But how many of you have heard of the BBC show Doctor Who. It is one of my favorite, scifi, fantasy, geeky, cheesy and clean shows. How to describe it, Well that is a bit hard to do....so here is a link to a great youtube clip that explains Doctor Who well. Doctor Who is actually one of the longest running TV shows. It started back in 1963 and if you want to figure out how it is still running....well I guess you will just have to watch it. If you are looking to try it Netflix has all the "new" seasons starting in 2005 when the show started rebroadcasting. 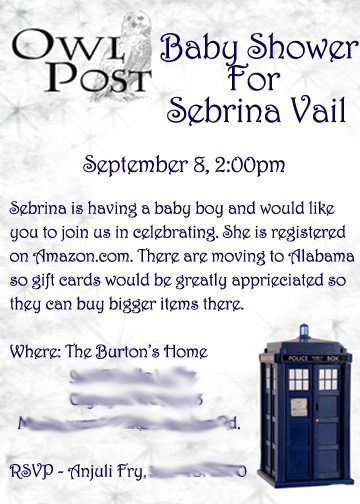 Well on to the Baby Shower, I teamed up with another of Sebrina's friends who was instrumental in pulling most of the decor together, even though she had never heard of Doctor Who. She found some great items and ideas. My Friend moved to Alabama the week after the baby shower so gift cards were suggested to help her because they had all ready packed. The cake and cupcakes made by my teammate. The cupcakes are wizard hats for Harry Potter and Bowties for Doctor Who. On the cake in the middle is key items from both Harry Potter and Doctor Who. They were all found on Amazon. 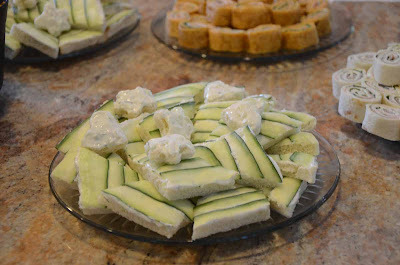 To add a bit to the British theme we had yummy cucumber sandwiches. And other delicious light snacks. 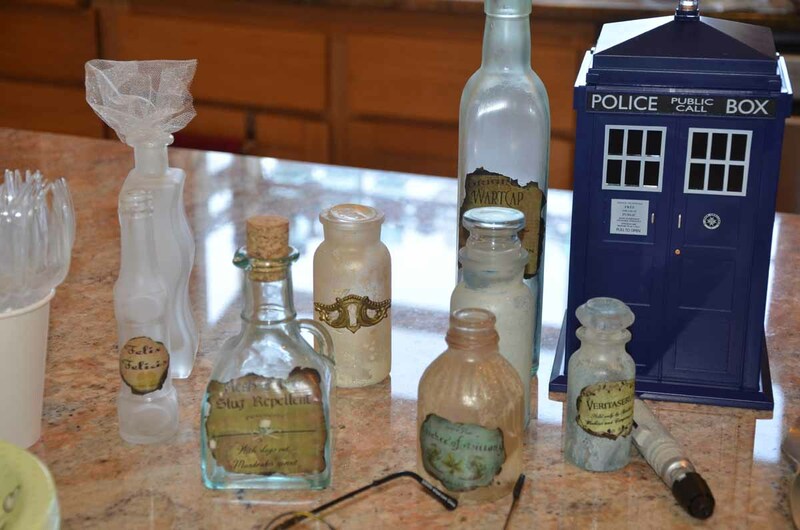 For Decor I pulled out my potions bottles that were made for my sons Harry Potter birthday last year. A Tardis cookie jar was found. And you can't forget the Doctor's Sonic Screwdriver. It is hiding. 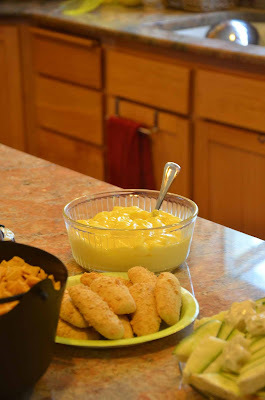 Another Doctor Who item, Fish Sticks and Custard. It was a lot of fun throwing this party. 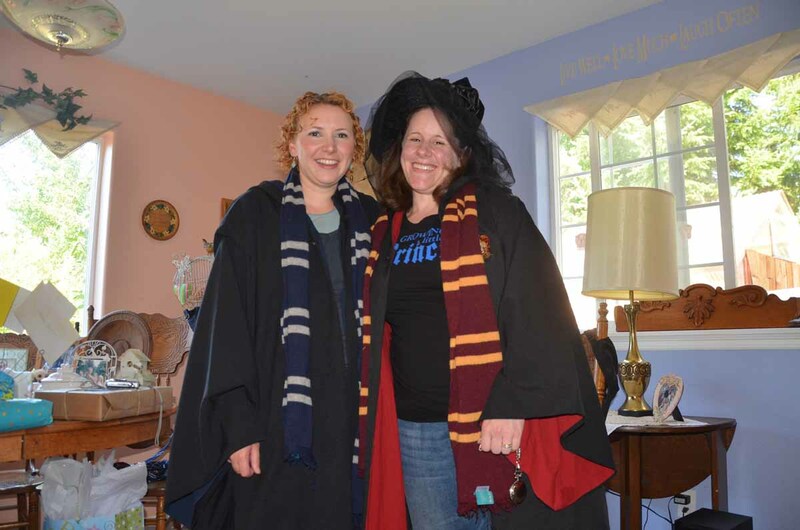 Sebrina even wore her Harry Potter robes and brought her husband's for me. For my gift I made a double side baby blanket for them. While on their honeymoon they were both sorted into Hogwarts Houses. Sebrina was sorted into Griffindor and her husband into Ravenclaw. So I made one side with Griffindor colors and the other side Ravenclaw colors. This is fantastic! Looks like so much fun! 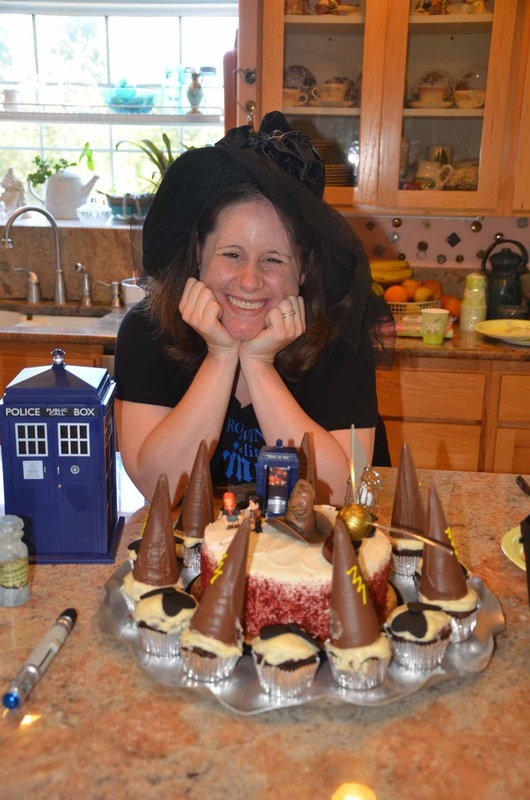 I am British and a huge doctor who AND Harry Potter fan - your cake looks great! I have been experimenting with some Harry Potter baking and so far have blogged about cauldron cakes, butterbeer cakes, pumpkin pasties! Its so much fun! I love you guys in your robes and scarf! Ooo, it's like you made a party just for me, or my daughter (she's away at Uni so I'm sending her a link to this right now!) I love it all! The You tube clip is great but you can sum up Doctor Who with one quote from, I think, the "Amy's choice" episode, the Doctor says "There's something here that doesn't make sense, lets go poke it with a stick!"